We've stopped for the night, and I have one of my vestibules open, revealing a view of jagged, brown mountain peaks, a dusty, rocky plain of nothingness. The sun, as it always does, sinks slowly behind the highest visible mountain, oranges and reds feathering out across the sky. I turn the volume up in my headphones and fall into a light sleep filled with strange dreams and snippets of other people's conversations. When I drift awake a few hours later, I'm cold, and I have to pee. I pull on more clothes; thick cotton sweatpants, fleece hat, camel wool socks, a bulky sweatshirt. I walk slowly, carefully navigating around tent stakes and bicycles laying on their sides or propped together, holding each other upright. The glow of cellphones is visible through the lightweight ripstop of some of the tents, strange ethereal light softened and dispersed by the greens and tans and oranges of the fabric, beacons possibly visible from far away, alerting the gods or passersby to our location. Not that the latter is present here. The former, perhaps, depending on what you believe. We're nestled at the base of a mountain peak, in a flat valley at about 4,000 meters above sea level, deep in the Pamir Mountains of Tajikistan. One local family shares this valley with us. 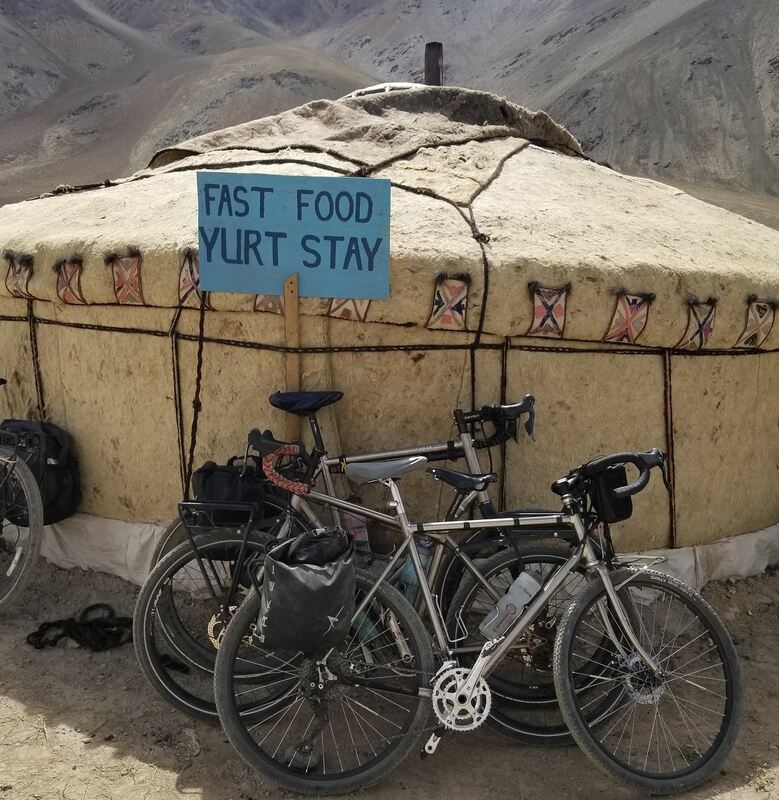 A sign that reads, "Fast Food, Yurt Stay," marks the turnoff. There is no McDonald's, but the yurt is indeed real and ready to rent if you're sick of tent life. There's no real cell service here, at least not data service. We're on what is commonly known as the "Roof of the World," so high our heads are almost, quite literally, in the clouds. The lack of oxygen makes that seem even more so. You can make a call up here, sometimes, but nothing more. Still, when I wake in the morning, I find my travel-mates seated on small folding, maroon camp chairs with bowls of oatmeal, about a dozen or so people balancing their phones on their laps next to breakfast, one hand holding a spoon, the other scrolling up and down a touchscreen. It's July 2018, and I'm in the middle of a cycling trip from Ulaanbaatar, Mongolia, to the Iranian border in Ashgabat, Turkmenistan. I'm with about 30 other cyclists from a range of countries, including the United States, Great Britain, Canada, The Netherlands (it was a cycling expedition, after all), Australia, and Ireland. We're loosely unified by a cycling expedition company based in Canada, with an emphasis on the "loosely" part. We rarely cycle together, each of us pedaling at our own pace, but we do make camp together every night and adhere to the same daily distance schedule. 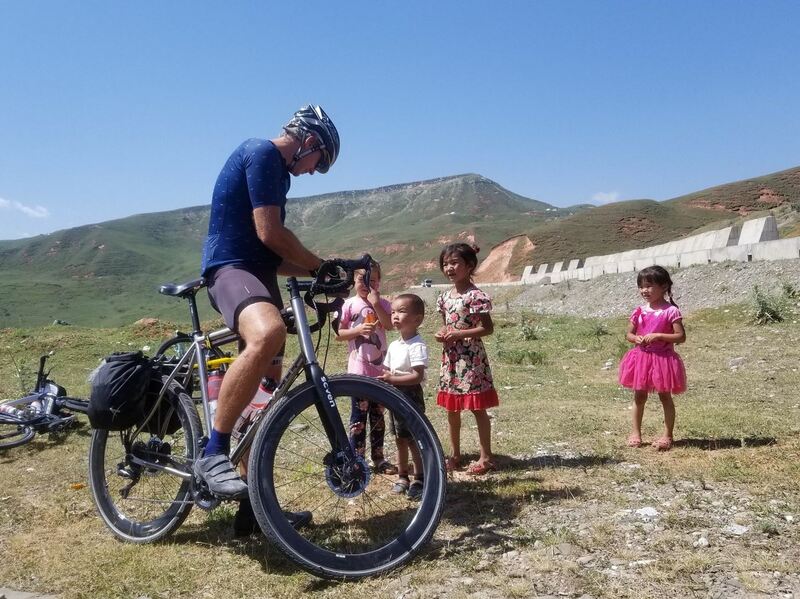 The complete trip consists of five and a half months of cycling along the Silk Route from Beijing to Istanbul. 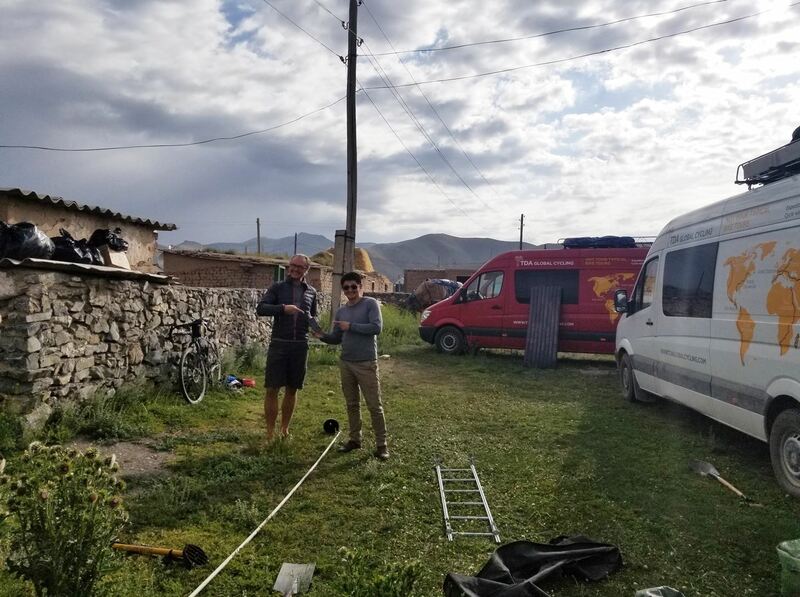 The portion of the expedition I'm doing is three months — riding through Mongolia, Russia, Kazakhstan, Kyrgyzstan, Tajikistan, Uzbekistan, and Turkmenistan. The most time we spend in one country is three weeks. A trip such as this elicits all kinds of hardships, annoyances, and tribulations — things like where to best pitch your tent, how to find some private time, and where the next coke-stop might be. Staying connected to friends and family back home, and to each other, as we cross some of the most remote landscapes on earth, is another daily challenge. Every five to ten days we have a rest day (a day of no cycling) in a city or village. Usually, this means electricity and Wi-Fi from the hotel. People "catch up" on everything internet then. Many of us keep our electronics charged between rest days with solar panels. I'm especially happy with mine from Biolite that also has an onboard battery to store power for later. I was able to charge my phone and Garmin (GPS cycling computer) every day. When placed in direct sunlight, my devices hit 100% power within a couple of hours. Richard, one of my fellow cyclists and a friend, has a battery pack that can charge his phone four to five times. I also use a Dynamo hub on my bicycle that generates electricity when I pedal. It's connected to a USB port on my handlebar stem. The predominant cellphone of choice among everyone is the iPhone — most people have an 8. The second most popular phone, used primarily by those who travel for a living (the guides and staff) or excessively often (like myself), is the international version of the Samsung Galaxy S8. One of the best features of Samsung's Galaxy line is that international models have a dual-SIM card slot, which lets you easily switch from one SIM to another. (If you buy your Galaxy from a US carrier or Samsung US, you'll receive a single-SIM version, so you need to order from Amazon to get the international dual-SIM). Samsung's SIM card manager app allows users to set their preferred SIM for calls, messages, and mobile data. You can also set the phone to confirm which SIM card to use whenever you make or receive a call. I always kept dual SIMs on, which let me accept a call on the inactive SIM even while in the middle of a phone call with the active one. Using a dual-SIM phone means you need to get a new local SIM card in every country. While there isn't usually too much of a language barrier issue, there are some pitfalls to this approach. The process of buying and changing SIM cards every time you change countries can be a pain, especially if you're only going to be somewhere for a week or two. Depending on where you purchase the SIMs, sometimes the process involves paperwork, and often you must present your passport. Opportunistic SIM card dealers and money changers hang out at land borders. As we cross, there are usually high fences, perhaps men with machine guns, some small dark hut where it's possible you'd be summoned to present paperwork, and people with things to sell. It's not unusual to see money quickly changing hands. Richard handled negotiations for our group, haggling for a better exchange rate or a discount on multiple SIMs. Sometimes he decides the SIM card price is too high and waits to buy one further into the country. A 3 GB to 5 GB SIM card usually cost between $6 and $12. Richard and his fans. Image via Vanessa Nirode. 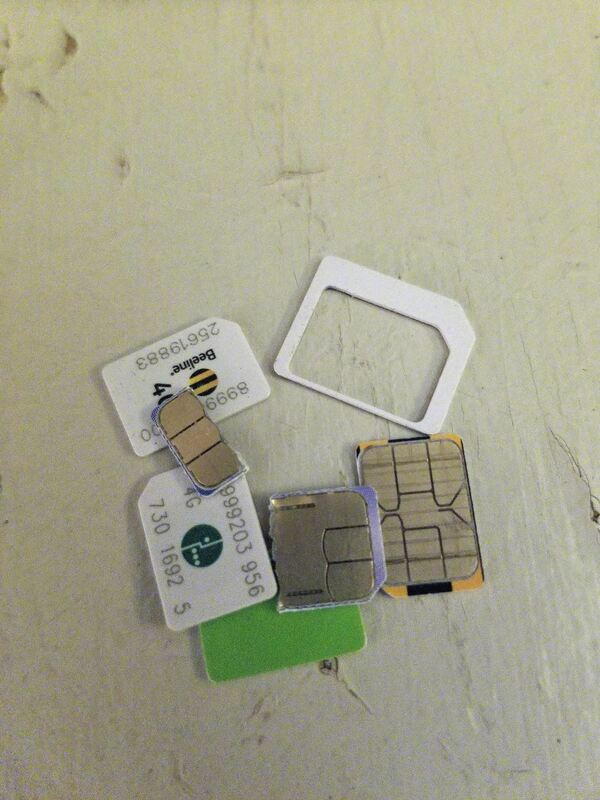 Changing out SIM cards is easy. Richard is perhaps the most reliant of anybody (except for the staff) on staying connected — he spent his days glued to his iPhone. He keeps his UK SIM card and SIM slot pin tool in his phone case. I spend many a meal with Richard watching him switch back and forth between SIM cards depending on what he is doing and who he needs to contact. That man can change a SIM faster than anyone I've ever met. As an iPhone user, I'm sure Richard was thrilled when the latest versions launched with dual-SIM capabilities, though they use one eSIM and one physical SIM, so you typically have to keep your primary line on the eSIM to leave the physical SIM slot free. Aside from the latest iPhones and Google's Pixel 3 on Android 10, there aren't many US phones that include dual-SIM functionality. But like the Galaxy I'm using, you can usually find a dual-SIM version of most flagship phones if you buy the unlocked or international variant from Amazon. For those who weren't changing out SIM cards all the time, there were some alternative ways to stay connected. My friend, Lino, from Spain, had a Flexiroam SIM card. Essentially, for a monthly fee, the Flexiroam SIM connects to whatever local cell network is nearby, eliminating the need to switch your SIM out. 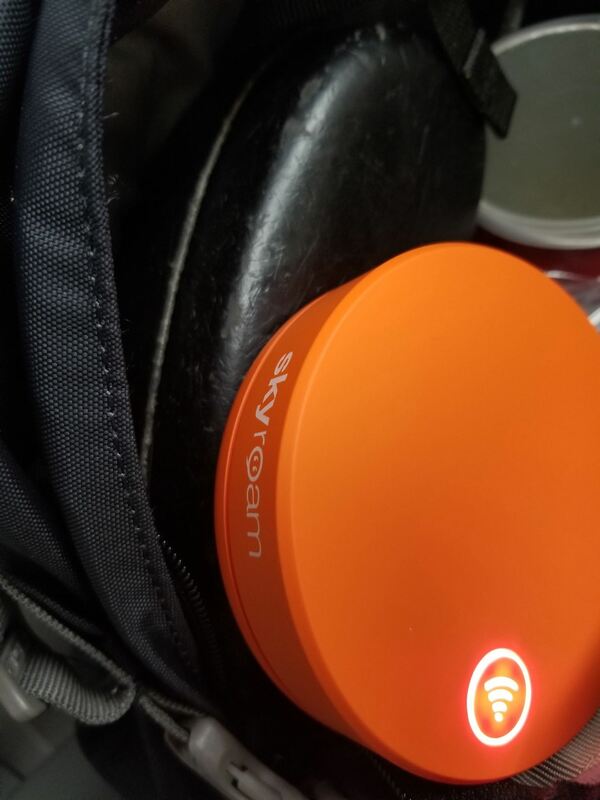 Another similar option is Skyroam, a mobile hotspot that uses the local cell network. For access, you can purchase monthly or daily plans in various data configurations. The monthly fee for unlimited data on Skyroam is $99. They also offer day passes for $9. Flexiroam prices depend on which country you are in, and how much data and time. They offer a 24-day 10 GB option that ranges from $10 to $39. Brunei and Cambodia are in the $39 price point. Most other countries hover between $10 and $14 for 10 GB. Egypt is one of the most affordable, at $6 for 10 GB. International data plans with your regular US cell carrier are also an alternative, though they're usually not the most economical choice. T-Mobile is known for its international plans, offering roaming in 210+ countries (one of the highest numbers among carriers) at discounted rates. AT&T (my US cell carrier) also offers monthly data plans from $40 to $120. One serendipitous international data-roaming incident happens at the Mongolia and Russia border. While waiting to cross, I receive a text from AT&T alerting me to their World Cup promotion of free international roaming in Russia. Our entry to Russia happens to coincide with the 2018 World Cup. Interestingly, the promotion remains in effect part way through Kazakhstan. I suppose that's not all that surprising as many people don't know where Kazakhstan begins and ends, let alone that it's a country. One afternoon in Kyrgyzstan, we're planning to set up camp in the yard of a guesthouse with hole-in-the-ground outhouses. Richard, by far the strongest cyclist of the group, arrives ahead of everyone else and pays for a room for us and a few other cyclers in the guesthouse with four beds. An indoor bed, even just a futon-type mattress on the floor, is gold on a trip like this, especially when it comes with a wall outlet with electricity and a shower down in the basement. I'm on my mattress, stretched out after a shower, reading a science fiction novel on my Kindle. Phil, the owner of a vegetable distribution company in Canada, is on a mattress to the left of me. Phil, in his '60s, has one of the driest senses of humor I've ever encountered. He can make me laugh just talking about mutton. At this point, he's the only one who has cycled every single kilometer of the journey. He'll end the trip still holding that title. Right now, he's stretched out, barefoot in shorts and a T-shirt, texting his girlfriend. Goran, an obsessive-compulsive Swede who loves to make lists, is shuffling around in his bag to the right of me, reorganizing all the bags within the bag as he is wont to do. Goran finally settles down on his mattress. Phil has fallen asleep, his arm outstretched over the edge of his pile of blankets, phone still resting in his palm. We're all just waiting for dinner to be ready. I'm deep into the dystopian future world of my book when Richard comes crashing through the door, yelling: "I dropped my phone in the shitter!" "Bek's going to help me get it out," Richard yells as he exits the room. Bek is our local support guide. He's youngish, probably in his late-'20s, and more interested in chatting with the ladies than doing much guiding or supporting, but he is useful for toilet cellphone rescues. Phil can't resist going to watch the action. He stands up, shoves his feet into his flip-flops, and heads outside. Goran and I look at each other and shrug, neither feeling compelled to hover around a smelly, deep hole of literal crap. About an hour later, I hear Richard and Phil come through the door of the guesthouse, laughing. A few minutes later they're inside our room, Richard triumphantly holding up his smartphone. "It still works!" he says. He explains how he and Bek used a long pole with a scoop on the end to retrieve it. "That's one deep hole," he says. "The only reason we could even see it," he continues, "was that it was wedged into a pile of … something … and it lit up when I happened to brush the screen with the pole." For weeks after, he complains of the foul smell emanating from the phone, a smell that, though the phone worked perfectly, never quite wore off. The next morning, we set off to climb another 500 meters into the mountains. We only have about 30 kilometers to travel to the next campsite. Richard, Goran, and I stop at a small café on the way out of town. The place has decent coffee, and even more desirable — reliable and fast W-Fi. Most villages and towns we go through have at least one café with excellent Wi-Fi. They're easy to spot as there will always be a couple of people hanging outside near the entrance on their phones. We don't talk to each other but instead sip coffee and "take care of things" on our phones. We'll be without any signal for at least a week once we leave this place as we cross into Tajikistan and over some of the highest mountain passes in the world. We all have a few apps on our phones that we use regularly. WhatsApp is how we all stay in touch with each other. Google Translate is another favorite app of ours. Just download whatever language we want to translate without a Wi-Fi connection. One of the coolest features of Google Translate is using it to "read" text in a foreign language. Using the app's camera, you can hold your phone over a menu and the app automatically translates the words as you move the phone. These features are now also built into Google Lens and Google Assistant if you have an Android phone. On iPhone, you can get them by downloading Google Assistant. Google is really and truly everywhere. They've succeeded in mapping pretty much the whole world. Even this remote Kyrgyzstan village has been mapped by Google. We use Google Maps for getting around cities and towns on rest days. Google Maps offers the option to download directions and maps for use offline. The GPS connectivity on your smartphone also allows you to view your location on a map when not connected to the internet. You can't navigate unless you downloaded the map before you went offline, but you can see where you are and the streets around you. We even used Booking.com to arrange private rooms for rest days. For directions and maps while on the bike, we use a Garmin GPS device. These work without Wi-Fi or cell networks, connecting instead to satellites. You preload a route onto your device, then you follow it (usually a purple line) as you pedal. There was never a time when satellite coverage wasn't available. Another cycling navigation tool is the RidewithGPS app (Android | iOS) where you can plan and create routes. With RidewithGPS, you can save and transfer your routes into many different file types compatible with versions of the Garmin as well as other GPS navigation computers. Our guides mapped our daily routes for the trip using RidewithGPS. The app works on your phone without service as long as your device has GPS. You can also pair most Garmin versions with phones over Bluetooth. We continue to climb through the Pamir Mountains, crossing the border into Tajikistan. Murghab is the only village in the eastern half of the Gorno-Badakhshan Autonomous Region of Tajikistan. At 3,650 meters, it's also the highest in the country. The Pamirs, in general, do not have cell service. Most of the land is undeveloped, and we go three to five days at a time without passing any houses or settlements. 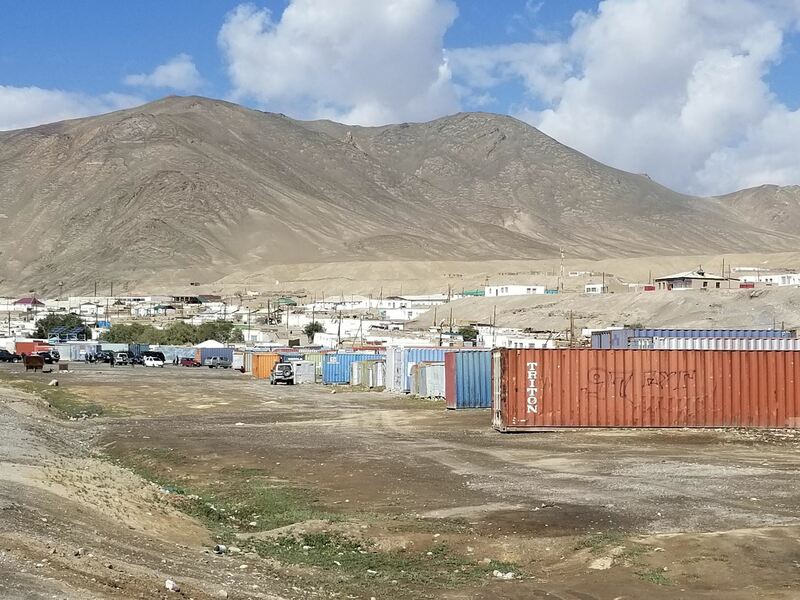 The day before we arrive in Murghab, our tour leader Andreas tells us that he hears that the town now has a 3G tower — a big step up from their previous Edge connection. At this point, we've been unconnected for a good seven to ten days. We're all looking forward to a hotel rest day and solid service to check in with our loved ones. Excited about the prospect of 3G, Richard, Goran, and I go to the market in Murghab to purchase Tajik SIM cards. The market is a few rows of those large shipping containers turned into stores, the cellphone store located near the entrance. We easily acquire SIM cards, but once we turn our phones on, we're met with shoddy connections. We traipse back to the cellphone store. They say, "yes, there's a 3G tower but it's currently broken." It's times like these that I realize the complete absence of a connection is better than a weak or spotty one. There is something oddly comforting about that circle with a cross through it signifying no service. When there's weak or fluctuating service, human nature seems to lend itself to trying in vain to load an app or send a photo — producing all kinds of angst and frustration when your connection lets you accomplish nothing. We struggle with that Edge connection for a day and a half. One of the tasks I'm trying to complete is booking a better room in Dushanbe. I try in vain for hours. Then I finally realize that I can make an old-fashioned phone call and talk to a manager at the hotel. On our last evening there, we all gather around tables eating the hotel chicken that would, as it turns out, make over half of us sick, when miraculously all our emails start sending and pictures upload. The 3G tower is finally repaired, just in time for our departure. The day we descend from the mountains is one of the best days ever, mainly because I can breathe fully again. Helen, our tour doctor from the UK, dubs it "Oxygen Appreciation Day." After this rest day, we'll head further out of the mountains, towards Dushanbe and the Uzbekistan border. Between the day we leave Murghab and the day we reach Dushanbe, a terrorist attack in Tajikistan leaves four cyclists dead. The attack takes place about 100 kilometers up the road from where we are. Because of the lack of cell signals, we hear about the attack after all our friends and families back home have already been worried sick about us for hours. 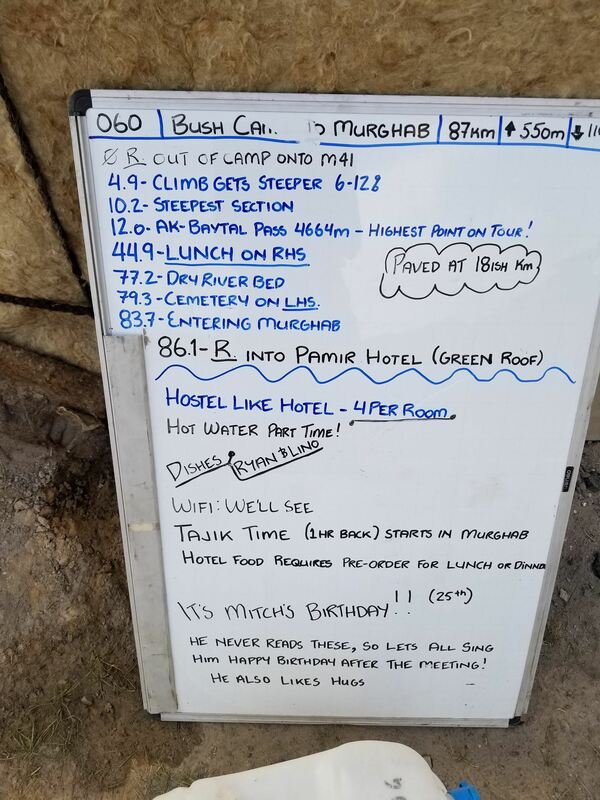 After a tense night at camp, where all the locals came out to check on us, the tour company head decides that the group will bus to Dushanbe where we'll stay for five days. From there, we'll bus to the Uzbekistan border, after which we'll begin riding again. Uzbekistan is hot, much of it desert. We stop for the night in a hot, stifling hotel with air conditioning only in the hallways. Richard, Goron, and I buy SIM cards at a store across from the hotel. We sleep that night in dorm-style rooms with our doors open hoping to coax some of the hallway air conditioning into the rooms. Whenever possible, I buy cold plastic bottles of water to sleep with. After a blur of hot days spent searching in vain for shade and ever-elusive refrigerated drinks, we move on. Eventually, we reach Samarkand, a wonderful, large, old city with tons of history, where Lino's girlfriend surprises him at the hotel. The only thing is: she apparently isn't his only girlfriend. She thinks she is though and posts some photos on Instagram with the tour hashtag, #tdasilkroute. Needless to say, after the visit, Lino has two fewer girlfriends. Turkmenistan, the last country for me, is more desert and even fewer people. Here, everything is blocked, including Facebook, Instagram, and WhatsApp. We attempt to use various VPNs (VPNs we try include Open VPN, Hotspot Shield, and Express VPN) to mask our location, none of which work consistently. Whoever is in charge of the blocked internet in Turkmenistan is entirely on top of their game. We get one VPN to work for about five minutes. Hotspot Shield provides the most success. Google Voice and Hangouts are, oddly, not blocked. The best thing I discovered is that if you have a US-based phone number, you can call anywhere for free using Google Voice no matter where you are in the world. I make a 25-minute work call from a hotel room in Turkmenistan. Another great Ashgabat (capital of Turkmenistan) secret is one of the restaurants in the mall has excellent Wi-Fi, and the VPNs always seem to work there. We all end up camping out there for hours. The waitresses love us. Turkmenistan is by far the most restrictive country we cycle through. Our local support tells us that purchasing a local SIM card in Turkmenistan is illegal. I'm not sure if it's genuinely unlawful, but it did involve a bit of finagling to get one. Richard, Goron, and I are in a bodega buying cokes, peanut butter, and ice cream. Richard chats to a local guy while Goran and I pay for our stuff. Somehow Richard convinces his new friend to take us to a cellphone store. I'm a bit apprehensive, but I climb into the backseat of the young man's Toyota with Goron. He drives us to a concrete building, the inside of which resembles an old bank or a US post office with the sales people sitting behind a wall and bars. After much discussion in Turkmen, he informs us that the ladies will indeed sell us three SIM cards as long as we show our passports. I happen to be the only one with documentation on me, so I slide it through the opening to the woman. Next, we launch into a pretty lengthy discussion about how much data we want. I don't remember what number we settle on, but I do remember the women looking at each other and shrugging and laughing. It isn't until later back at the hotel in the middle of another quiet VPN struggle that we realize there was no way we'd ever use the amount of data we'd purchased. When the government's firewall has blocked all the social media and photo sharing sites, there's not much data you can actually send. A few days later, I fly out of Ashgabat's shiny, new, and empty airport. My layover is in Istanbul where the internet is once again unblocked and strong. Turkey is often said to be the gateway between the east and the west, and right now it feels that way to me. I don't remember what the first thing I do when I'm back in the lands of unblocked internet. I probably open up Instagram and notice that the feed now loads. I mean, I don't think. "Oh hey, now there's the internet. I'm going to check Instagram." I'm just back in the data stream. I'm in airport travel mode, which is a familiar mode to me. Even now, more than six months later, I'm still processing and figuring out how I feel about my trip. I hate to throw out a cliché, but this experience quite literally changed my life, and I don't have the words for it yet. 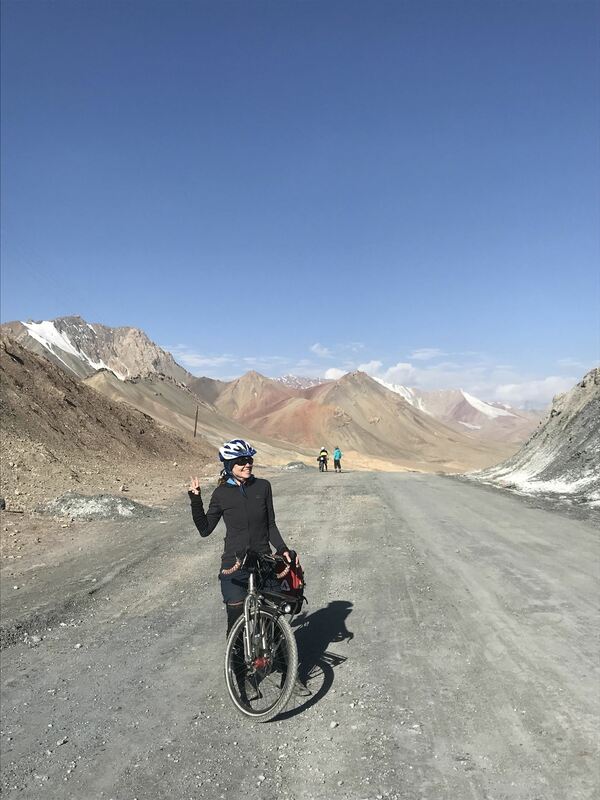 I also don't have a quick, easy, acceptable answer for what possessed me to ride a bicycle across Central Asia for three months. I'm not looking for myself or the meaning of life or anything like that. I'm not running away from anything. I'm not trying to get over some trauma. It's something similar to why I ride my bike everywhere even — it's just who I am and how I want to live my life. I think it's often difficult to figure out where you belong and where you don't, at least it's always been like that for me. The only thing I know for sure is that I don't belong in the same place day after day after month after year after year. I don't. That's the best explanation I have, as well as just a desire to enjoy the fresh air, silence, and sunsets. This article was produced during Gadget Hacks' individual coverage on traveling with your smartphone. Check out the whole Travel series.